The husband and I have been shopping around for a dining room table and chairs. We set a budget and it was beginning to look impossible. Until today. We found a great white and natural wood table for a great price at a local furniture store! We were so excited. They had chairs that matched but they were really expensive and we knew we could find a better deal elsewhere. Last week we went to a cute little antique store that a friend of ours recommended. They had lots of fun chairs and funky furniture so we decided to go back today to look for chairs to go with our new table. I wanted 6 chairs, but I didn’t want them all to match. We lucked out and found this cute white chair and were able to buy 3 of them for the same price as one chair at the furniture store! Score! And we were able to pay cash for everything, which felt great. 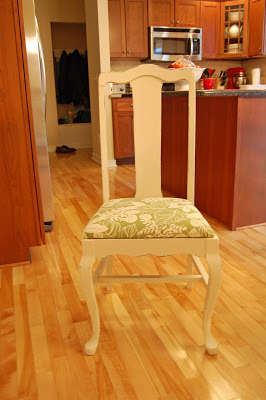 I am going to re-cover the seats to match our kitchen…when I get a chance. The table doesn’t arrive for 4 weeks, so I have some time! We still need 3 more chairs, but for now we will use 3 black chairs that we already have. We love mixing them together! Oh, and I guess you can see a little of our kitchen in the photo! I promise to post some pictures of the kitchen as soon as it is painted…which should be soon….I hope. I love the chair shape and the idea of mixing and matching. Get you interior designer on!! Can’t wait to see the finished results. Jon will love to here you shopped at an antique store. You better be prepared to take him there next time we see you. Love the mismatched idea…..it will look great!